Parks Canada has approved Mt Norquay's plan for improvements to Banff's closest ski resort for both summer and winter use. Visitors and Rocky residents alike will enjoy the proposed widened runs as well as the upgrades made to the historic Cliff House. you will enjoy the broad observation deck with panoramic views of the Bow Valley and the town of Banff. The vantage point from Mt Norquay gives visitors a unique perspective of the mountains they are used to looking up at! Interested in hitting the trails? Part of the new plans for Mt Norquay include a "via farrata" or cable-assisted hiking for some summer fun. Now because Mt Norquay is located within Banff National Park, the wildlife that make their home in the area were also taken into consideration in this latest developmental plan. Norquay will close one run which is located in a wildlife corridor and restore the area to its natural state. People can also expect to have group transporation up the mountain in an effort to limit the personal vehicles making use of the roadway. Although you can expect to start enjoying the Cliff House in the summer of 2013, the other plans are slated for a 2014 completion date. Personally, I really enjoy Mt Norquay. 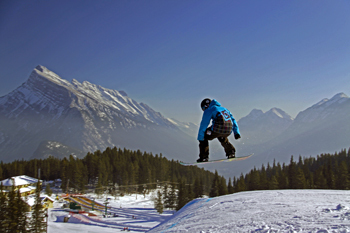 It has a variety of slopes for skiing and boarding - both challenging and fun - and its close proximity to the town of Banff make it a favourite among locals. On the drive up the mountain, I often encounter wildlife such as Big Horn Sheep, deer, elk, Columbia Ground squirrel to mention a few. There is even a pull-out halfway up the mountain which gives you the chance to get out and enjoy the view. At night you can take advantage of this spot for a moon-lit memory of Banff.